A great evening north of Pardeeville, WI for the Organic Vegetable Twilight Field Tour at Norman Miller’s Farm. It is clear that the drought conditions during the 2012 field season have caused issues for even the irrigated crops. Much of the evening focused on insect issues (covered by Russ Groves), disease issues (covered by Amanda Gevens) and physiological issues pertaining to fruit set and fruit quality. Several growers brought along peppers with blossom end rot (Fig. 1). 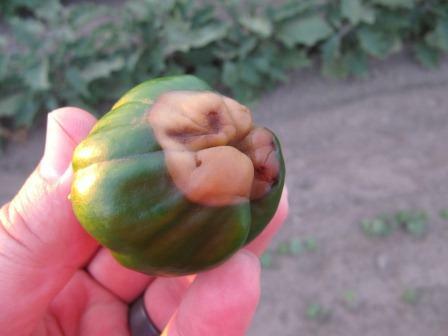 Blossom end rot can be related to calcium (Ca) deficiency. However, most Wisconsin soils are not deficient in Ca. Other factors such as excess N or K application or lack of root development were ruled out as well. The main cause of blossom end rot appears to be water stress. Even with drip irrigation supplying water to the crops, it has been difficult to provide enough water. Water stressed plants are not able to translocated Ca from leaf tissue to fruit, causing the physiological disorder. 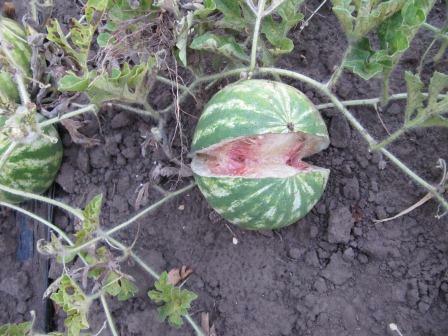 Another issue observed that growers field was split melons (Fig. 2). It is unclear the actual cause, our best guess as a group (after considerable questioning of the farmer) was that it was caused by uneven irrigation and heat and water stress during non-irrigated periods. There were also specific questions about odd shaped fruit for cucumber and tomato. The root cause of these physiological symptoms are all likely the same. It has been difficult to supply enough water consistently throughout the day to keep plants from experiencing stress. Growers who only irrigated every other day have seen the most fruit quality issues.